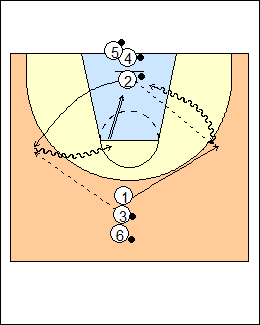 1 flare cuts to either wing from the top, catches a pass from 2 with a jump stop facing the basket, attacks with a crossover step baseline for an outside-inside power layup, or a crossover middle for a pull-up jump shot. After passing, 2 cuts to the opposite wing for a pass from 3. 1 and 2 rebound and change lines, 3 goes next. - post shooting - short corner and opposite elbow. See Shooting - Blasone, Borg, Fill cuts, Jenkins fill cuts.